You may recall my frustration earlier in the spring when I was weaving the cloth, and I was bored of weaving the same pattern over and over again. 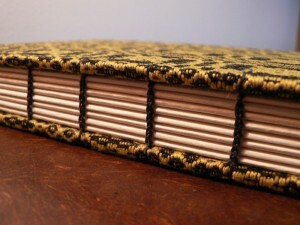 I complained about it at the time, and then got re-inspired when I bought some new tabby weft colors. I also switched from weaving the design star fashion, which creates boxes and distinct diagonal lines as you weave, to weaving rose fashion, which makes the motifs rounded and gives a sense of concentric circles rippling outward. I realized that part of my “bored” feeling was a worry that the cloth was objectively boring, i.e., that other people would find it boring, and that despite all my time and effort, I wasn’t making anything beautiful. Now that the books are all done, I don’t have that worry anymore. 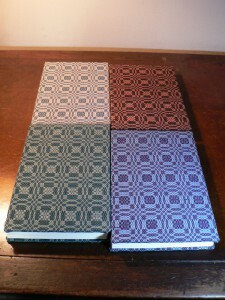 Below you can see four of the books. 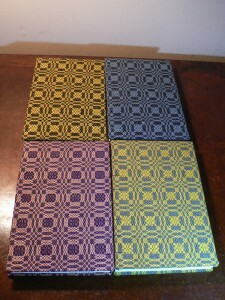 From top left going clockwise these pattern wefts were dyed with weld (black tabby), woad (black tabby), weld (light blue tabby), and madder (purple tabby). And below are the other four. From top left going around clockwise the pattern wefts were dyed with madder (blue tabby), madder (black tabby), woad (purple tabby), and weld overdyed with woad (teal tabby). 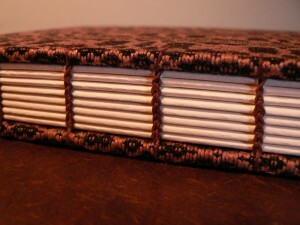 Below are some close-ups showing the stitching I used for the Coptic binding. 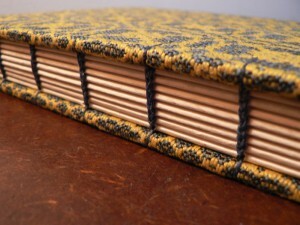 I use waxed linen thread and try to match it with the cloth colors. 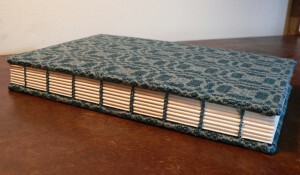 I have considered using a contrasting color of binding thread, but I prefer the feeling of integration. 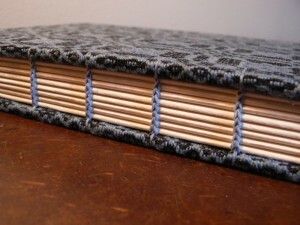 I find it fascinating how a single pattern weft color can look so different when combined with different tabby colors and binding threads. 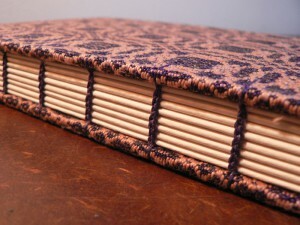 I want each book to be one-of-a-kind, even with my limited palette, and so far I have been able to achieve that.